What better way to start your day? Oxford is home to some of the best brunch spots and we have scouted them out just for you! Big Bad Breakfast is no ordinary brunch, it is a quaint café located off of North Lamar, serving creative twists on classics, and house-cured Tabasco/Brown sugar bacon you definitely don’t want to miss out on! Start your brunch off right with with a coffee, OJ, Mimosa or Bloody Mary. 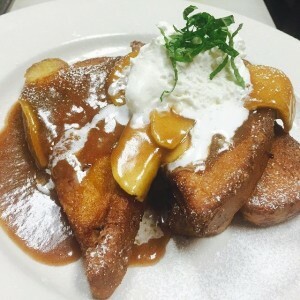 Once your thirst is quenched, check out their extensive menu with options including the Big Bad Breakfast plate, The Awesome Omelette, and the Elvis, to name just a few… Be sure to check out their specials like Apple Cinnamon French Toast as pictured above. You will be sure to leave BBB with a smile on your face, wanting to come back for more! Oxford Grillehouse is a classic Southern steakhouse centrally located on Oxford’s Town Square. Serving more than just steak, Oxford Grillehouse offers one of the best brunches in town with their eye-catching ‘Build Your Own Bloody Mary or Mimosa Bar’ with bottomless Mimosa’s and Bloody Mary’s from 9:30am to 2:30pm on weekends, and menu items ranging from Eggs Benedict to Shrimp and Grits and Chicken and Waffles. Off the beaten path, the Ravine is a rustic-chic spot located three-miles south of Oxford’s Town Square. This is the perfect spot for your Sunday brunch outing! Carefully sourced contemporary Southern cooking, the Ravine draws its inspiration from locally grown, fresh and seasonal foods, including some from the gardens overlooking the restaurant’s outdoor terrace. You don’t want to miss out on Ravine’s house-made brioche cinnamon rolls, made with with cream cheese icing and pecan streusel, or the Benediction, another tasty item pictured above. 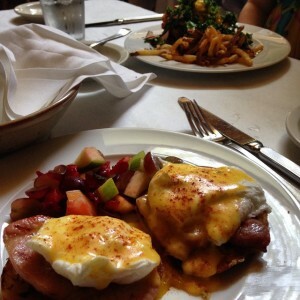 City Grocery, James Beard recipient Chef John Currence’s landmark restaurant, is a classic brunch spot located in a historic, two-story building in the heart of the Town Square. City Grocery’s loyal customers are continuously coming back to enjoy one of the best brunches Oxford has to offer! With its hip vibe, Bottletree Bakery’s great atmosphere for paring studying with a cup of joe, is located just off of the Town Square. Bottletree’s baked goods are made fresh daily with mouth-watering pastry options and coffee so good, you won’t be able to have just a cup! The Beacon Restaurant, with its Southern accent, has been Oxford’s down-home breakfast spot for many years. Serving food in an old-school diner environment, the Beacon is sure to provide you with an unforgettable meal and bring you back to Mississippi’s roots. Honey Bee Bakery is located off of West Jackson Avenue. From bread, cookies and cakes, to their soups and sandwiches, their food is deliciously real and heartily served. Stop by Honey Bee Bakery on Saturday from 8-2 and Sunday from 9-2 for a brunch handmade from scratch with love! Locals Restaurant and Bar, located just off the square on North Lamar, serves Sunday Brunch from 11:00am to 3:00pm with $3 Mimosas and $4 Bloody Mary’s. Lusa Pastry Café is a breakfast and brunch spot serving Portuguese eats and sweets. High Point Coffee, with two locations, one off the square on North Lamar and one off of West Jackson Avenue, is home to coffee roasted at Right Bean Roasting, here in Oxford. Be sure to stop by and try some of Oxford’s own coffee! Oxford Canteen is a fun, alley-located brunch spot on the Town Square, with morning menu items from tacos to tortas, served all day in addition to their salads, bowls, sandwiches and sweets. We credit our summer intern, Meggie Morgan, for this blog post.